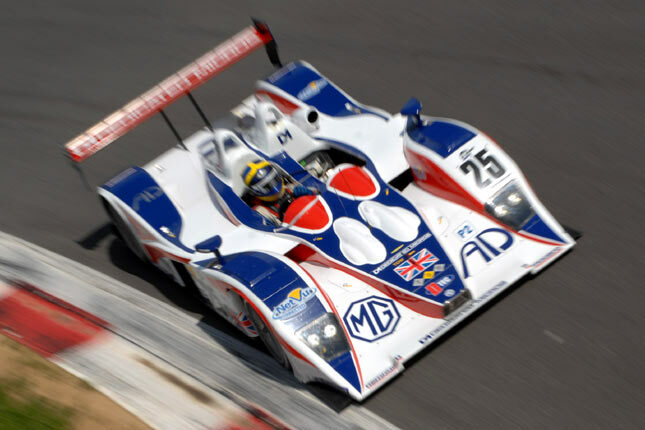 Despite a succession of difficulties in Free Practice, including a blown engine within two minutes of starting their Monza campaign, RML AD Group’s Thomas Erdos managed an exceptional lap in qualifying for Round 2 of the 2008 Le Mans Series to re-establish the team’s MG Lola EX264 amongst the front-runners in LMP2. After the disappointments of the previous day, when the engine failure had cost them half the day’s practice, expectation had not been high. The team’s engineers had performed heroically in replacing the original unit in under three hours, but missing the entire first session had meant that detailed preparation for the demanding Monza circuit was well behind schedule. With the new engine fitted in time for Friday’s second practice the team was able to exploit the full hour of track-time, but it was soon apparent that the MG’s set-up was far from perfect. Undaunted, and in typical RML style, the team knuckled down to sorting out the problems, and by the time Erdos headed out to begin his qualifying run on Saturday afternoon the car was back to peak form. Strategically aware to the last, Phil Barker held Tommy back for almost ten minutes before releasing the Brazilian into a gap in the traffic. It was an opportunity he exploited, coming through on his second lap to set a new best-ever for the MG at Monza, posting 1:38.697 to move into a strong class fifth. Having struggled to manage eighth in practice, it was a significant achievement, and placed Erdos just one tenth behind Michael Vergers in the #32 Barazi Zytek. Only Casper Elgaard in the #31 Essex Porsche would subsequently improve, and as the flag fell to end qualifying there was an air of satisfaction and relief in the RML garage. “Considering we’ve been on the back foot all meeting, that was a great effort today, and a very good lap from Tommy,” declared Phil Barker, Team Manager at RML. “To have the Vergers car just a tenth in front, and all the others ahead of him brand new cars this year, I don’t think the result is too upsetting.” The three Porsche RS Spyders topped the class, headed by Jos Verstappen in the Van Merksteijn example, with the new Speedy Sebah Lola Coupé fourth. Part of that strength stems from the excellent relationship between Thomas Erdos and his co-driver, Mike Newton. “From a personal perspective, I’m delighted that I managed to improve on my best ever lap here by almost two seconds,” said Newton, who’d set the time in a three-lap run at the end of the final practice session. “In the context of the times being set by the other cars here, that’s not bad at all, but I’m just mindful of the fact that these Porsches are six seconds quicker than me!” In truth, they’re several seconds quicker than everyone else as well. “I’m happy with that, but to be two seconds behind pole is such a vast difference,” said a pragmatic Thomas Erdos. “We’ll just have to keep pushing, keep trying, and see if we can close the gap.” Last year the MG started third at Monza and led its class for most of the race before a coolant leak slowed the charge. It crossed the line in second. This year’s race starts at 12:50 local time and will last six hours or 1000 kilometres. A similar result would be very welcome. There are high resolution images posted in the Monza Gallery.